Chris Joubert sent along an article he’d found on airshow photography and I thought I’d add a link to the article I used as a reference when I first started attending airshows with my camera. 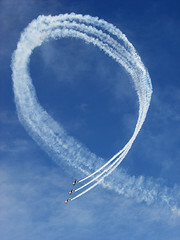 Those wishing to try their hand at some airshow photography should mark the 14th November 2009 on their calendars. This is the date of the next show at the SAAF Test Flight Development Centre near Bredasdorp.